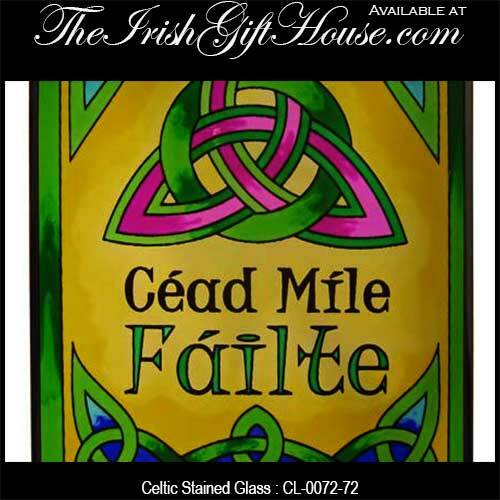 This Celtic stained glass suncatcher features Céad Mile Fáilte, the Irish welcome, along with knot-work. This Celtic stained glass suncatcher depicts a favorite Irish greeting, Céad Mile Fáilte, which means a hundred thousand welcomes in Gaelic. In Ireland this is the way by which the Irish greet each other and visitors to this green isle. The Irish have long been renowned for their hospitality, friendliness and easy going manner. This Celtic stained glass suncatcher features an Irish welcome blessing, Céad Mile Fáilte, and is enhanced with knot-work that includes an interlaced Trinity. The Irish suncatcher measures 6" wide x 7 1/2” long and is constructed of glass with a metal rim along with a metal chain for hanging. The Celtic suncatcher is ready to hang in your window and it is gift boxed with a Celtic knot history card that is complements of The Irish Gift House. 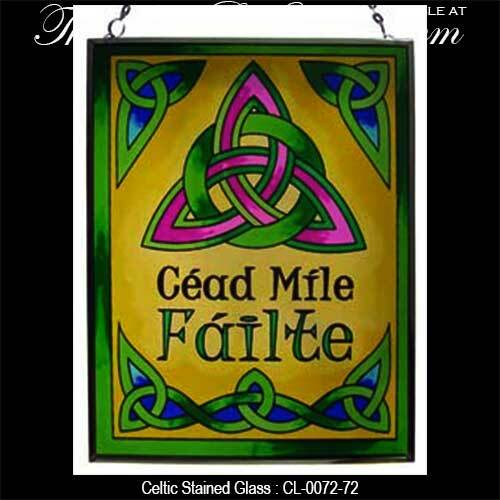 This stained glass Irish greeting is made in Ireland by Clara.